Mary Beth tipped me off to this dress, by NotAMermaid, which was featured on SewRetro (which I do read, but am behind on … I seem to have inadvertently invented a time machine, as I am always living about two days behind everyone else). What are some other summer-themed dresses we could throw out there, as a challenge for other summer-anticipators? Something with a bathing-suit print of course (SO much easier to wear a bathing-suit print than an actual bathing suit); mint juleps and/or iced tea (not literally; I'm thinking a light brown dress with green banding); that great picnic-tablecloth fabric with the little ants printed on it (I've always wanted to make a circle skirt out of that); a dress in wide tiered multicolored stripes (like a beach ball) … so many options, so many, many long and somewhat chilly weeks until summer. Oh, I turned off moderation … too many people's comments were getting lost and those thrice-damnéd spammers (shhh! don't draw their attention!) seem to have found other blogs to bother. Unless the spammers come back in force I probably won't turn it back on. That’s a fabulous dress. I’m making a red vintage dress to wear as soon as it’s warm enough here. It has pockets, which reminds me of you. I love it! I love it! It’s already getting warm here in SC. Soon it will be gates of hell warm. I lemonade dress would be so refreshing. I saw parasol fabric on reprodepot I thought would be a very pretty Spring dress. Butterick Patterns are $1.99 at Jo Anns this week. I think I am going to buy the whole retro line. One of my favorite maternity dresses was a vintage shift, white with pink and green watermelons. Now that I’m done baby-having, I’m thinking about altering it. I was so thinking of watermelon! Heh. Patti, how funny is it that you had a maternity dress with watermelons on it? I’m thinking that cherries would be a nice summertime theme; they work well on a white or a black background, and should therefore fit in with whatever accessories are handy (because although I buy accessories with enthusiasm and delight, I am a big sluggard about changing bags, etc. And changing shoes means changing bags, and the whole lot …)It is a fabulous dress. What accessories do you wear with it, Notamermaid?Theresa, if you posted about “what size bust do I buy my pattern by” a post or two ago, I’ve answered it, as best I was able; if you haven’t done so already, you might want to go back and check it. Sorry about the links in the comment above, you’ll have to cut and paste! It is picnic weather here in NYC. 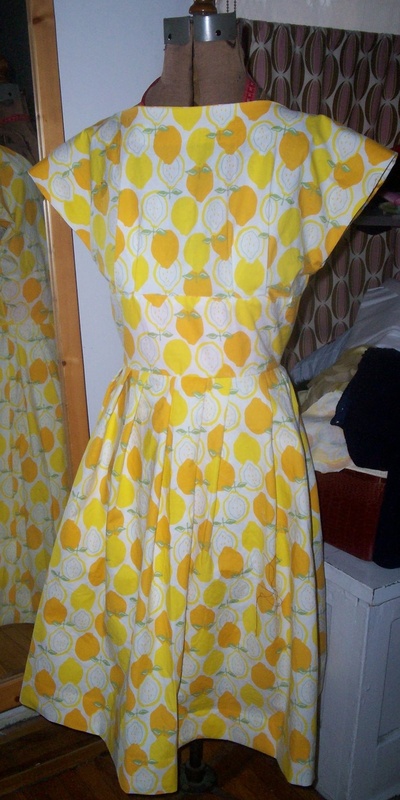 I’ve got a 60’s mini dress printed with big blue apples (with bites out of ’em) that would love to picnic with a popsicle dress and a lemonade dress.Brava, Ms. Notamermaid! This is a lovely frock indeed. Patti–the watermelon-themed maternity top is hilarious!My summer novelty prints are mostly oceanic: seashells, seahorses. I’d love a shirtwaist dress with mermaids or lobsters,or both. Or maybe the Wonderwheel at Coney Island. But my dream is a dress with a souvenir print of Istanbul. Has anyone seen one?Erin, I love the idea of a novelty print dress with old-timey bathing suits. Would it be possible to make one that you could actually swim in? I mean, without it looking like a burqini. (Sorry for the lack of html tags, but for photos of burqinis, they are here http://www.ahiima.com) I’m thinking of something that would look more like 60’s Alfred Shaheen cocktail dress sets. And of course have pockets. I’ve been seeing lots of flip-flop fabric.I saw some ice cream cone fabric. Cherries is a great idea – you see it alot on retro redoes of dresses like the ones at daddy-o’s website. Maybe the ice cream cones could pcinic with the lemons, popsicles and cherries? LaDonna – still looking for the bust size post. samsara – I’m actually in NY as well, loving the 60ish weather and wearing my lemonade dress.labelladonna – I wore tan linen round toe pumps with brown leather trim, a light green spring coat (it was chilly this am; coat pics are on my blog), and a cream leather tote. In the summer I’ll wear white shoes, either retro wedgies or open toe pumps, and lose the coat (obviously!) Most of my dresses either go with white/tan accessories or black ones. Althought I do have bright red shoes I like to wear with navy and polka dots! hey, i love your blog.I’m currently looking for partners for my new fahsionexperts.org site.i hope you are interested :)please email me at: fashionexperts.org@gmail.com if you accept our partnership.PS: the site will open next week. Thanks.Have a nice day! Notamermaid, it sounds lovely! Bless you for being brave enough to wear light-coloured accessories in NY – heck, for wearing colour at all in NY!Theresa, I left you a fairly detailed post in the preceding entry on the Maternity Dress pattern; it’s at the bottom of the page. I have a sneaking suspicion you are buying WAY too large a size for yourself, especially if you are a DD and are buying by your bust measurement. Go back to the Maternity Dress entry and read why. And if you don’t have the skills to size up from one of the teeny patterns, save your money until you find one of the sites that does reproductions of period patterns in a range of sizes! You will have enough to challenge you just doing the Full Bust Alterations. (The good news is, once you’ve made the FBA so it fits you, you know you’ll have to do the same alteration to other patterns. I have a t-shirt knit dress that has pails, shovels, and beachballs on a blue background. It’s a great summer dress. Too bad it doesn’t fit me right now.I’m tempted to make myself an old-fashioned bathing suit (think 1920s, bloomers and dresses style) just for the looks I would get if I wore it to the beach. Of course, I would not be making it out of wool! I made a skirt last year out of that ant-covered picnic fabric. 🙂 I must say, it does make me feel more cheerful and spring-y, just wearing it.I love your mint julep dress idea! After two days teasing us with 60 degree weather it snowed last night with more expected, so reading posts of summer fun dresses will have to do until summer actually arrives in a few months.Re: baseball dresses. If you can’t find actuall baseball print, try blue and white pillow ticking fabric (looks like the old fashioned uniform stripes) and then jazz it up with red piping/trim and appliqued names.